This is a great craft for kids, they get so excited at Christmas time. How it works is each night before Christmas, just before they go to bed they take off one link from the paper chain. Then when they go to bed the night of Christmas Eve, they just have the bell left and they know Santa will come. First, cut out or have the kids cut out a bell shape from construction paper. Second, cut the construction paper into strips (preferably using two different colors). The strips should be approximately 1 inch wide by 8 inches. 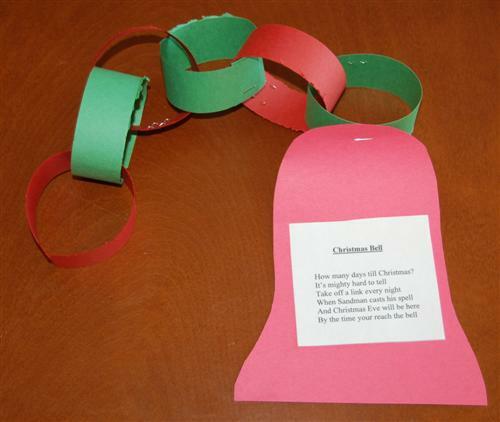 Next, loop the paper strips together and staple them so you have a paper chain. Then staple the chain to the bell. Write out the following poem, or print it out using the template provided (PDF format). Glue it on the middle of the bell and enjoy!